Next week's challenge, from Lowell Beineke of Fort Wayne, Ind. : Name an 11-letter occupation starting with H. If you have the right one, you can rearrange the letters to name two things a worker with this occupation uses — one in six letters and one in five. What occupation is it? If you know the answer to next week's challenge, submit it here. Listeners who submit correct answers win a chance to play the on-air puzzle. Important: Include a phone number where we can reach you Thursday, Oct. 6, at 3 p.m. ET. I briefly considered mentioning that the vice presidential debate is this week or that we have fewer than 40 days until the election. But then I realized there should be at least one safe space left, and you're in it right now. Let's play The Puzzle. 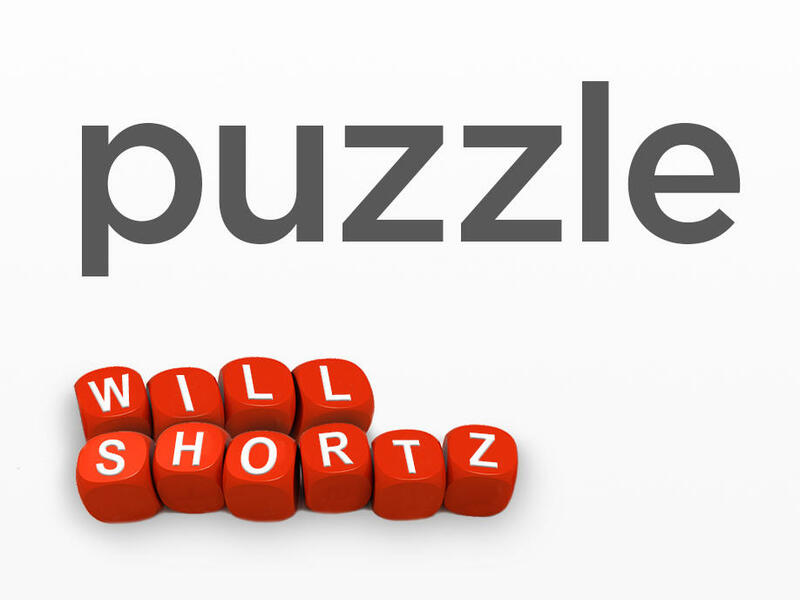 MARTIN: I am joined by the puzzle editor of The New York Times and WEEKEND EDITION's puzzle master, Will Shortz. Hi, Will. MARTIN: Remind us of last week's challenge. SHORTZ: Yes. I said take the words does, toes and shoes. They all end in the same three letters, but none of them rhyme. And I asked, what words starting with F, S and G have the same property? And I said the words are four, four and five letters respectively. Well, the answer is foul, soul and ghoul. MARTIN: All right, so a whole lot of you got the right answer to this. Two thousand correct answers we got. And our randomly selected winner is John Leatherman of Sanford, Fla. He joins us on the line now. Hey, John, congratulations. JOHN LEATHERMAN: Well, thank you. Good morning. MARTIN: So did it take you very long to get the answer to this particular puzzle? LEATHERMAN: Well, I figured that the key was the G word and the second letter was probably a consonant. And so five-letter G-consonant words, that kind of narrowed it down. MARTIN: Very well done. And tell me about Sanford, Fla. What do you do there? LEATHERMAN: I'm a software engineer. And it's a suburb to the north of Orlando. MARTIN: All right. So, John, are you ready to play The Puzzle? MARTIN: OK, Will, let's do it. SHORTZ: John and Rachel, every answer today is a pun on a well-known food brand at a grocery or supermarket. For example, if I said you're looking for a breakfast cereal and your clue was tiny golf pegs, you would say Wheaties, as in wee tees. SHORTZ: (Laughter) OK. Number one - you're looking for a malted dairy drink, and your clue is a roundish person who hasn't yet reached the age of 20. LEATHERMAN: OK, that - malted drink, teen - Ovaltine. SHORTZ: Ovaltine, you got it. MARTIN: Oh, Ovaltine. Oh my God, that took me a minute. SHORTZ: Number two - peanut butter. If you say that the first seven letters of the alphabet are A, B, C, D, F, G, H, what'd you do? SHORTZ: ...So here it is again. LEATHERMAN: Skippy. Skippy. Sorry, Skippy (laughter). MARTIN: Yeah, Skippy. Oh my God, I love this. SHORTZ: Skippy. You skip E.
LEATHERMAN: Sorry, had to listen to it (laughter). MARTIN: I love this puzzle. SHORTZ: Your next one - TV dinners. They're, you know, those things in the frozen food. And your clue is a clever person at a financial institution. LEATHERMAN: Bank - wait, what - no. Healthy? No. SHORTZ: Well, what's a financial institution? SHORTZ: Yeah, there you go. And a clever person at a financial institution? SHORTZ: Well, maybe you don't know the brand. That's possible. SHORTZ: Well, hold that answer, Rachel. That's coming up. SHORTZ: ...Bank is going to be in the answer. MARTIN: ...Bank. I can't think of it. What is it? SHORTZ: OK, it's Banquet. A banquet or a bank wit. MARTIN: I do not know that brand. SHORTZ: Sorry, Banquet Foods. Here's your next one. This is another one, frozen foods. SHORTZ: An alas uttered by former West Virginia Senator Robert. SHORTZ: Bird's - Bird's Eye is right. Frozen dinners - to store animal coats in a safe place. MARTIN: Stouffer. Oh, it was Stouffer. SHORTZ: Rachel was just predicting that earlier. SHORTZ: Here's your next one, a beer. Fill in the blank - every year I'm older, blank. SHORTZ: Budweiser is right (laughter). A breakfast cereal - bank drafts made at a University in Houston. LEATHERMAN: Checks - Rice Chex. SHORTZ: Rice Chex is right. Chewing gum - tiny amount of raw metal from a mine. SHORTZ: Well, think of a raw metal from a mine. What is that? SHORTZ: ...Is right. Your next one is a dessert topping - what singer Helen uses to make a horse go faster. MARTIN: Oh, that was fast. SHORTZ: And your last one is ice cream on a stick where cooing birds get drunk. SHORTZ: That would be a Dove bar. MARTIN: That was amazing. That was very well done, John. Congratulations. LEATHERMAN: Thank you. A lot of fun. MARTIN: And you probably know this, but for playing The Puzzle today you get a WEEKEND EDITION lapel pin - very exciting - and all kinds of puzzle books and games. Check out your prizes at npr.org/puzzle. And where do you hear us, John? What's your public radio station? MARTIN: John Leatherman of Sanford, Fla. Thanks so much for playing The Puzzle again, John. MARTIN: OK, Will, what's the challenge for next week? SHORTZ: Yes, it comes from listener Lowell Beineke from Fort Wayne, Ind. Name an 11-letter occupation starting with H. If you have the right one, you can rearrange the letters to name two things a worker with this occupation uses, one in six letters and one in five. What occupation is it? So again, an 11-letter occupation starting with H. Rearrange those letters to name two things a worker with this occupation uses, one in six letters and one in five letters. What occupation is it? MARTIN: When you've got the answer, go to npr.org/puzzle and click on that submit your answer link. Just one entry per person, please. Our deadline for those entries is Thursday, October 6 at 3 p.m. Eastern time. Don't forget to include a phone number where we can reach you at about that time. And if you're the winner, then we call you and then you get to play on the air with the puzzle editor of The New York Times. And he is WEEKEND EDITION's puzzle master, Will Shortz. Thanks so much, Will. SHORTZ: Thank you, Rachel. Transcript provided by NPR, Copyright NPR.